This October, AIP Foundation is preparing to launch two major public awareness campaigns in Vietnam and Cambodia, targeting child and passenger motorcycle helmet use. These campaigns will reach thousands of people, and we're very excited to see it roll out next month. Read on to learn about the other ways in which we're lowering road traffic related injuries and fatalities in Asia and Africa, and don't forget to find us on Facebook! DfID must 'stand by its word' and fund global road safety say MPs - A report by the Ministers of Parliament called on the UK Government to honor a financial commitment it made to support road safety in developing countries. According to this report, the UK's Department for International Development (DfID) has gone back on it its pledge made in 2009 to give grant support to donor-led road building projects in developing countries. Click here to read the full report. Ministers of Health Approve Action Plan to Reduce Traffic Injuries - Ministers of Health of the Americas have approved a new plan of action on road safety designed to prevent traffic injuries, the leading cause of death in children aged 5 to 14 in the hemisphere and the second-leading cause of death for people aged 15 to 44. The plan was approved during the 51st Directing Council meeting of the Pan American Health Organization (PAHO). It calls on countries to update legislation to address the principal risk factors of traffic injuries: excessive speed, alcohol consumption, and the use of seat belts, helmets, and child restraints. Other priority actions include promoting policies on public and non-motorized transportation and encouraging industry to adopt technical inspection systems for all vehicles in circulation to ensure compliance with safety standards. From October 2-7, Global Helmet Vaccine Initiative's (GHVI) Regional Development Director, Lotte Brondum, and Dr. Terry Smith, helmet standard specialist, travelled to Uganda, Tanzania, and Kenya. GHVI was requested to assist these countries with amending their motorcycle helmet standards. Uganda, Tanzania and Kenya have seen an increase in their numbers of motorcycle related accidents, injuries, and deaths in conjunction with an increasing number of registered motorcycles. In Tanzania, the lack of regulations requiring driver permits for motorcycle operation have led to a high number of untrained motorcycle riders. In Kenya, tariffs and taxes on motorcycles have been eliminated, which has resulted in the number of both registered and unregistered motorcycles rapidly increasing. In Uganda, most motorcycle drivers act as taxis, or boda bodas, transporting un-helmeted passengers into the city center and back. While this provides a much needed income opportunity for unemployed youth, accidents are frequent. Indeed, 12,360 road accidents take place annually in Kenya, an increase of 36% since 2006, and the number of deaths reached 4,072 in 2009. According to statistics from the traffic headquarters, over 300 people were killed in road accidents in the month of May 2010 alone, while 1,000 suffered serious injuries. So dire is the situation that hospitals in Kenya have dedicated entire wings to motorcycle accident victims. GHVI 's trip to Uganda came after the government requested assistance to amend their current helmet standard and invited GHVI to attend their first technical meeting on the issue. Meetings were held with the Uganda Helmet Vaccine Initiative team, the Ugandan Bureau of Standards, the Minister of Transport Hon. Abraham Byandala, and the US Centers for Disease Control and Prevention (CDC) country office. Currently, GHVI has been invited to review the latest draft of the new standard and will continue to be involved in this process until it is approved. In Tanzania, GHVI was asked to review an initial draft of their amended standard. The team also met Rita Paulsen, a Helmet Vaccine Initiative Tanzania's Goodwill Ambassador, and discussed televised opportunities for helmet promotion. The partnership between Tanzania and GHVI was facilitated thanks to the Tanzanian Prime Minister Mizengo Kayanza Peter Pinda. In Kenya, GHVI has been requested to provide support in the planned revision of the standard currently in use. 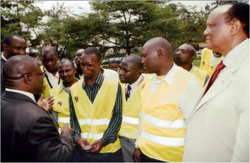 GHVI attended meetings with the Injury Prevention and Information Centre of Kenya, Mr Cosmas Ngeso from the National Road Safety Council Secretariat, and the Kenya Bureau of Standards with Mr. Pius Clement Chomu Miheso. AIP Foundation has a new Facebook page which is being updated with news and pictures of our activities and beneficiaries, including young road safety champions! Follow us on Twitter to get daily information on road traffic safety news around the world, and be the first to know about our events. AIP Foundation's Thailand team has its own Facebook page focused on Thai road safety news and accessible to our Thai speaking community. Show your support by clicking Like, following us, and sharing our pages with your friends and colleagues! Toll booths to curb city traffic - Lam Thieu Quan, Tien Phong Technologies Group (ITD) president and CEO is featured in a Vietnam News interview about a plan to control traffic congestion in Ho Chi Minh City by installing automatic tollgates. The first grade students at Nguyen Thi Dinh Primary School received shiny new helmets from a sponsor who has been helping children stay safe on Vietnam's dangerous roads since 2009, Cai Mep International Terminal Co., Ltd (CMIT). AIP Foundation facilitated this donation through their Helmets for Kids program, with strong support from the Ba Ria – Vung Tau Department of Education and Training. Helmets for Kids was first implemented in Nguyen Thi Dinh School in 2010, when CMIT donated nearly 700 helmets. This year, CMIT supplied 250 additional helmets to the incoming students, making their slogan 'Safety for Life' a real priority. Parents, CMIT staff, AIP Foundation staff, and government officials came to watch student performances and express their commitment to improving road safety in Vietnam. FedEx Express, and AIP Foundation, the implementing agent for Safe Kids Worldwide's programs in Vietnam, officially launched the Click on Safety e-Learning program at Xuan Trung Primary school, Xuan Trung Commune, Xuan Truong District, Nam Dinh Province. At this school, 90% of students walk to and from school, which means that they are in great need of safe pedestrian skills. The program, which is part of an expansion of the Walk This Way program to northern Vietnam, aims to provide children with the opportunity to experiment with traffic consequences in a fun and risk-free environment. At the Opening Ceremony, AIP Foundation and FedEx handed over the e-Learning software to first graders along with teaching equipment including a laptop, projector, and screen. In addition, 700 pedestrian safety booklets and reflective jackets were distributed to keep children safe when they travel on the road. A traffic safety corner consisting of a mock up intersection with pavement and four working traffic lights is being installed to allow children to practice safe road behaviors. FedEx volunteers assisted with a training workshop for 20 teachers held in Xuan Trung School after the ceremony. The workshop showed teachers new e-Learning methodologies, how they can apply the e-Learning program in the classroom as well as support the school to organize extra-curricular activities as opportunities to allow students to practice their pedestrian skills. FedEx's involvement with Xuan Trung Primary school is all the more significant because they supported the school being built. 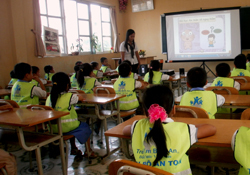 The Click on Safety programs has previously been piloted in a school in Dong Nai province. Road tax rip-off - Offices have continued to overcharge on road tax, despite the Anti-Corruption Unit's recent outlaw of facilitation fees. A Taxation Department report, compiled by Affiliated Networks for Social Accountability, said that there were still agents selling road tax stamps at a higher fee. On October 12, a letter was sent to the Minister of Public Works and Transport on behalf of Cambodian road safety stakeholder groups AIP Foundation, Handicap International Belgium, Medical Teams International, Automobile Association of Cambodia, and Coalition for Road Safety. Motorcycle passengers in Cambodia are not currently required to wear helmets, and observations have shown passenger helmet use to be at 8%, a dangerous habit which leads to many preventable fatalities and injuries each year. In addition, nearly 25% of passenger deaths in Cambodia are children under 19 years of age. As the Ministry finalizes an amendment to the current helmet law which will require passengers to wear helmets as well as drivers, this letter appealed to the Minister to include children of 2 years of age and above in the legislation. The request hopes to prevent further deaths of innocent children on Cambodian roads. ARRB, an Australian group that provides research, consulting and information services to the road and transport industry through workshops and seminars, has committed to donating $15 from each workshop participants' registration fee to Helmets for Kids in Cambodia. ARRB is the leading provider of road research and best practice workshops in Australia, a field that aligns itself well with AIP Foundation's goals and methods. A national research institute with a membership comprised of all 10 state, federal, territory and local government agencies in Australia and the federal government of New Zealand, ARRB ensures the maintenance of Australia's capability in road safety engineering. ARRB also participates in setting road safety best practice globally. With each contribution of $15, AIP Foundation can purchase a certified helmet for a student, hold trainings for teachers and students, and conduct Monitoring and Evaluation to improve our programs further. ARRB leadership will attend a helmet handover ceremony after the trainings are completed, and symbolically present helmets to elementary school students. Our school-based programs are deeply reliant on our generous sponsors, and involvement such as ARRB's makes a big difference in improving the safety of Cambodian students on the road. Flood toll rises, traffic jams up - On October 13th, the devastating floods taking place in Thailand has caused 225 roads to remain inundated and impassable. Inundated highways and local roads two meters under water caused additional difficulties for the people whose lives were most severely impacted by these floods. On October 15th, Mr. Thomas Raldorf organized a charity racing event in Pattaya, Thailand. The event received a generous sponsorship from the Pizza Company and Deborah Services Co., Ltd. In addition, Bira Circuit provided the racing track without charge. Drivers donated their time and mechanics to allow participants to be driven around the race track and experience the thrill of being driven in a race car by an experienced driver. Proceeds from the event will be donated to Helmets for Kids Program in Thailand. Police ban Boda Boda at Cranes match - The police banned Boda Bodas from circulating around Mandela National Stadium, the venue of the Uganda versus Kenya Africa Nations Cup qualifier match which took place on Saturday October 8th. This article states that "the police have previously accused the motorcyclists of causing the highest rates of traffic related accidents" and that this explains their ban. Uganda Helmet Vaccine Initiative held two major events in September to spread information about the importance of helmet wearing for motorcycle taxi drivers, also known as boda-bodas. A 250 person public rally was organized to disseminate information among the Rubaga Division of Kampala, and sensitize people to the importance of road safety. The following week, a full day workshop was held for 100 boda-boda drivers and Kawempe Division leadership to train the participants in road traffic safety skills and correct helmet use. The workshop attendees were tested before and after the workshops to measure their new knowledge. These activities hope to curb the disastrous numbers of road traffic injuries and fatalities currently taking place on Uganda's roads.